Tutor-Student Matching: How does it work? With the busyness of contemporary lifestyles, it is more important than ever that the role models in students’ lives are positive ones, demonstrating outstanding values, great study ethics, and everything that lies between. Tutors, in the very privileged role of being educators who spend time one-on-one with their students, need to be the right match. This is the reason tutor-student matching is taken so seriously at Nepean Tutoring. Location – where is your student based? Are there local tutors who provide the service your student needs? (Yes! We have tutors throughout Nepean and surrounding regions). Age and experience – what year level is your student in, and what experiences would they most benefit from in a tutor? “Students shouldn’t be sharing these things,” the teacher said. “What things?” A student asked. The student looks confused. “What’s that?” She asks her teacher. “It’s a secret!” The teacher replies. Learning essays or Pythagoras’ theorem doesn’t have to be a riddle. It is the role of a personalised tutor to turn abstract theories into accessible content grounded in students’ real-world experiences. Otherwise, students are alienated by unnecessarily complex explanations. As Albert Eistein once said, ‘Everyone is a genius. 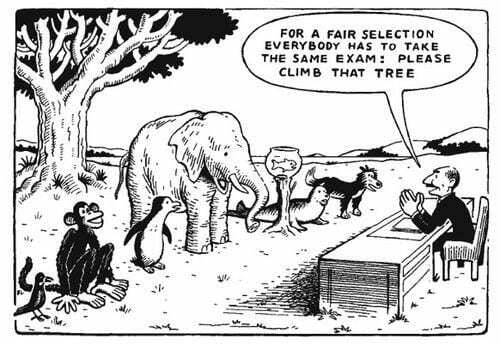 But if you judge a fish by its ability to climb a tree, it will live its whole life believing it is stupid.’ Having a tutor who relates to a student’s experiences and individual personality makes all the difference. Friends are the family you choose, and so are tutors!